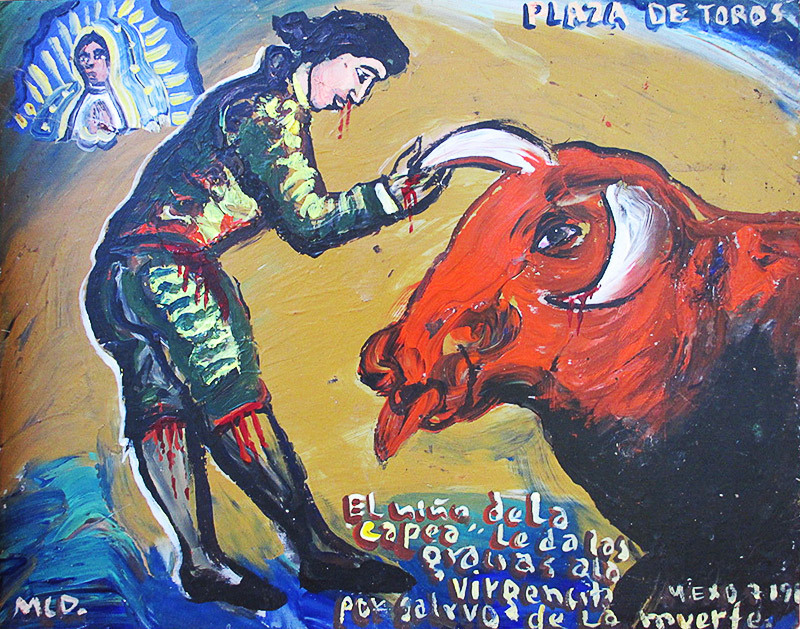 The boy from the Capea thanks the Holy Virgin for saving him from death. Irena and Rosa went to the market together. Suddenly an enormous bull came from an alley. He was probably escaped from its corral. He was in bad humor and began to chase the woman. They entrusted themselves to Saint Quiteria for they didn’t want to die being gored. The bull started to snort, and they got more scared. 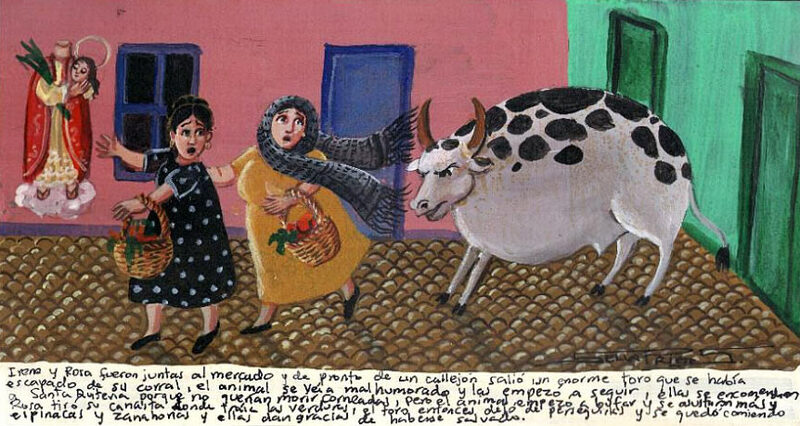 Rosa threw out her basket with vegetables, and the bull stopped chasing them and began to eat spinach and carrots. Irena and Rosa thank for they were saved. Thank you, Holy Virgin of Guadalupe, for granting me your protection every time I risk my life on the arena going to the furious bulls. 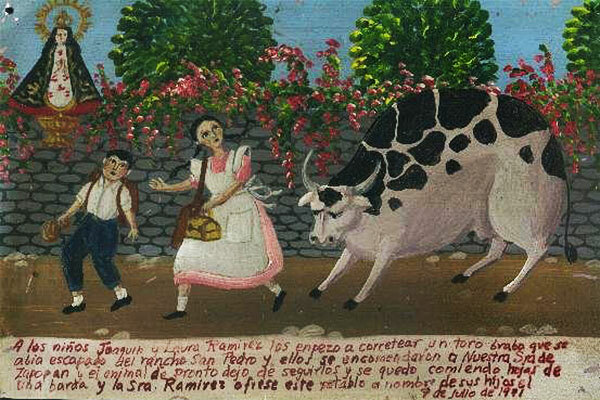 An angry bull ran after Joaquin and Lara Ramirez. It escaped from the San Pedro ranch. 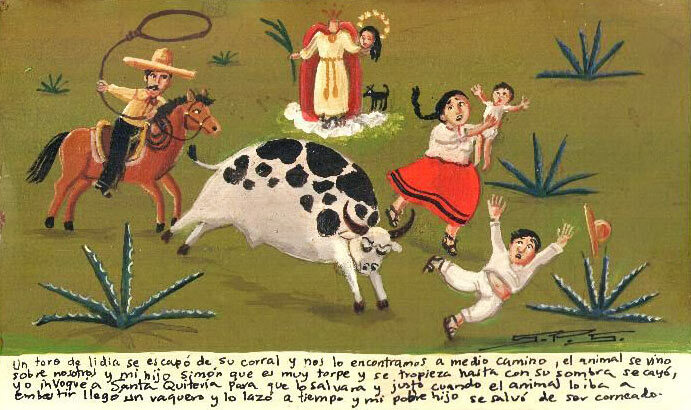 The children prayed the Virgin of Zapopan, and the animal stopped chasing them and began to eat plants from the fence. 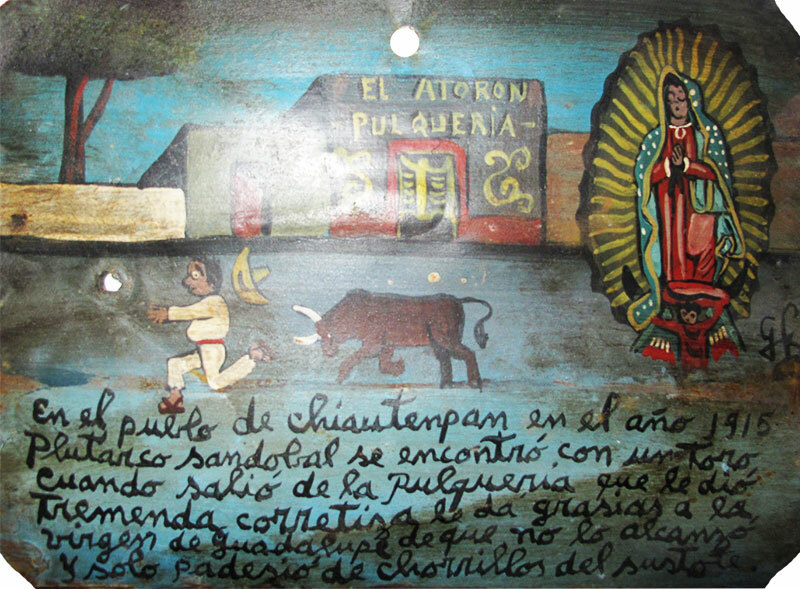 Señora Ramirez offers this retablo on behalf of her children. A fighting bull escaped from his corral and ran into us. The animal began to chase us, and my son Simon who is very clumsy and stumbles over his own shadow fell down. I implored Saint Quiteria so she would save him. And when the animal was about to attack my son, a cowboy came and lassoed the bull. My poor son was saved from being gored. 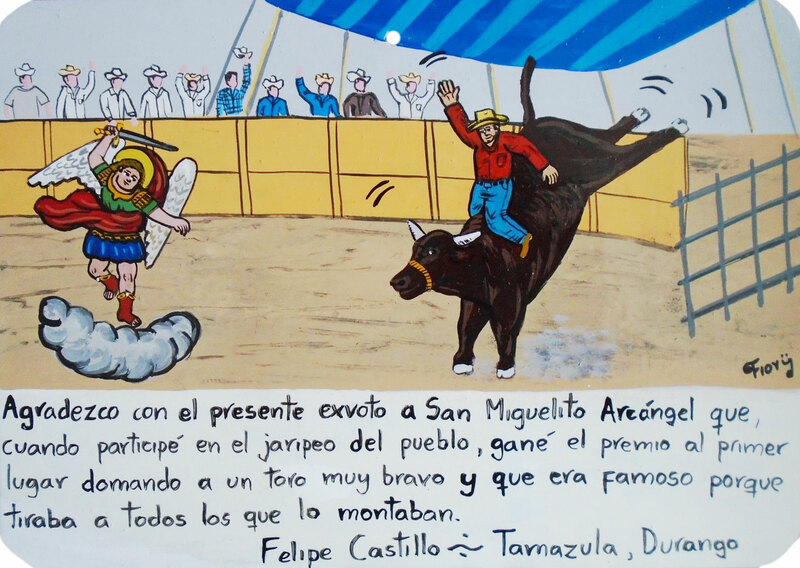 I thank Saint Michael the Archangel with the present retablo for I won the prize and the first place at the town rodeo when I tamed a very angry bull that was famous for throwing everyone who tried to ride him. 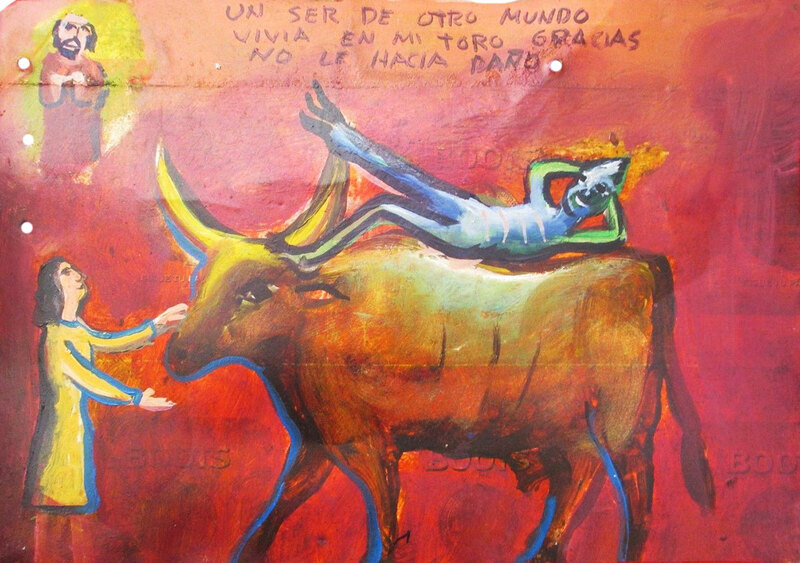 A being from another world lived on my bull. Thanks for it didn’t hurt him. 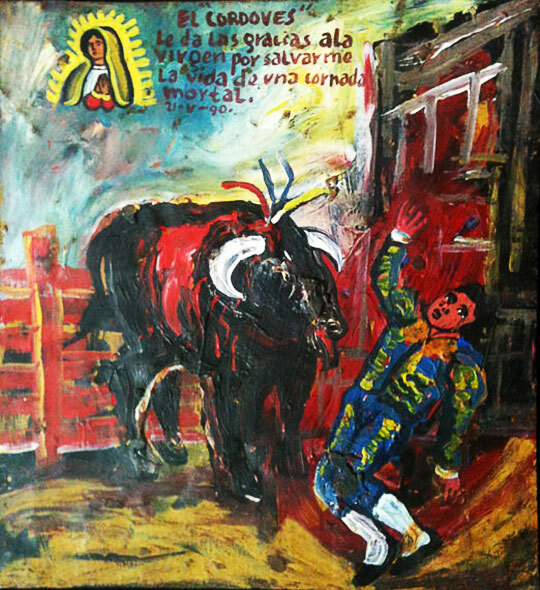 The bullfighter El Cordoves thanks the Virgin of Guadalupe for surviving after being deadly gored. 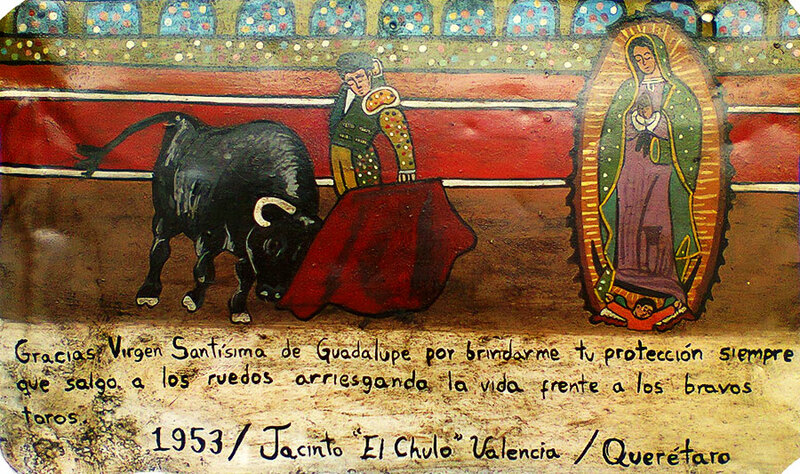 The torero Catarino Mendoza brings this retablo thanking Saint James for healing the wound on his buttock after being pierced by the bull. 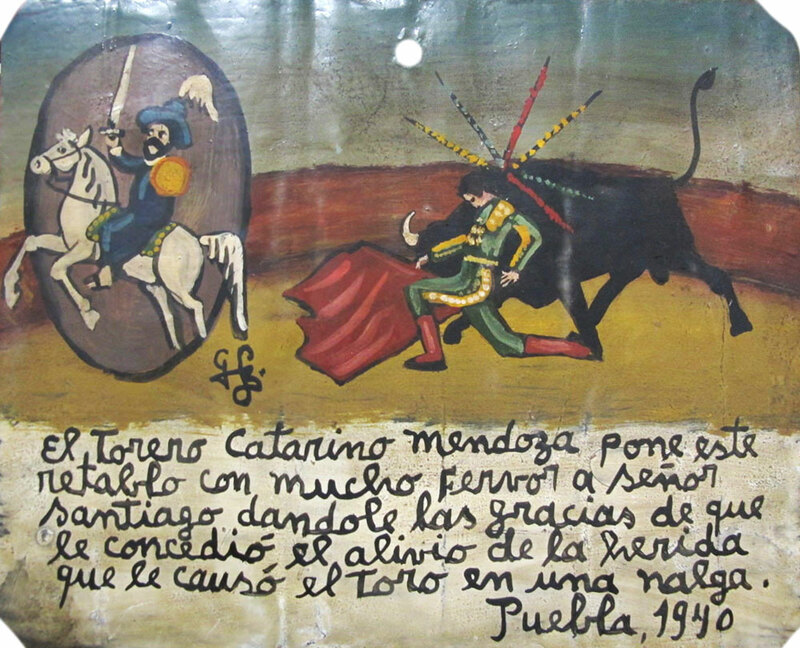 1915, Chiautenpan, Plutarco Sandoval met a bull on his way out of a bar. The bull started to chase him. 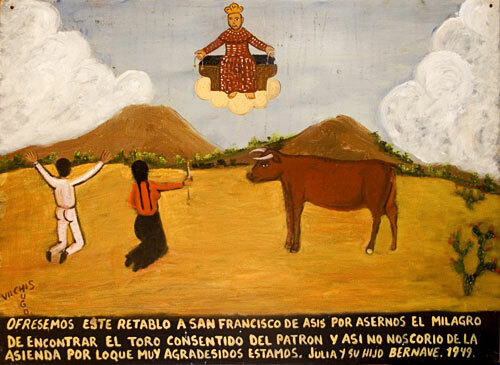 Plutarco thanks the Holy Virgin for the bull didn’t get him and he only shat his pants out of fear. 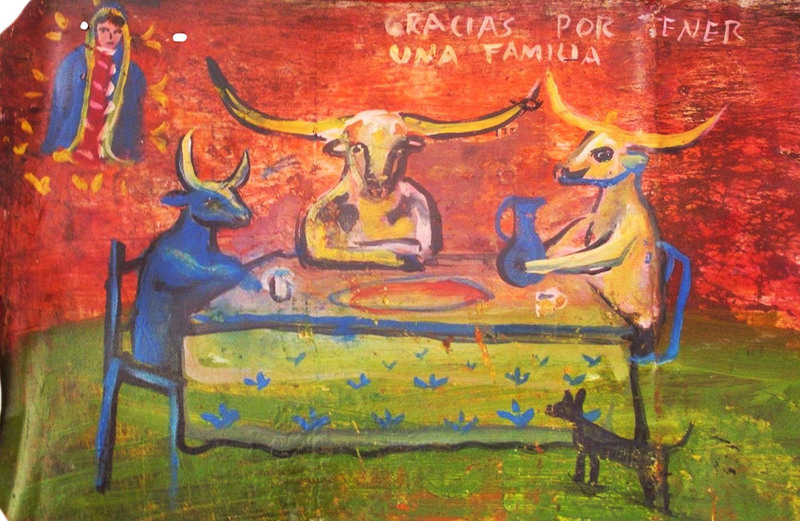 We offer this retablo thanking Saint Francis for the miracle of finding that spoiled bull of our master so we won’t be kicked out of the hacienda. We are very grateful. Thanks for having a family. I thank Saint Liberata. When I was performing at the Plaza in Tabasco, the bull Fanfarron got me badly. But I was lucky—I got only one leg amputated and one eye removed. 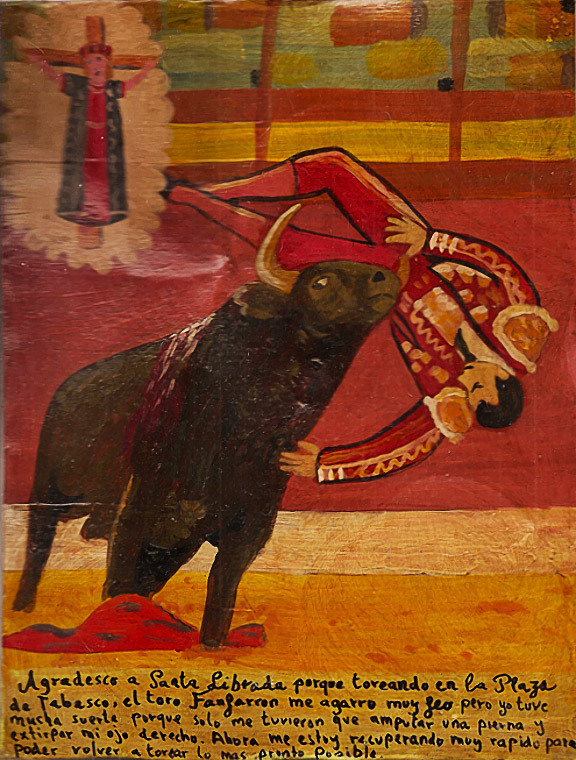 I’m recovering quite quickly so I could back to bullfighting as soon as possible.